This topic contains 188 replies, has 164 voices, and was last updated by Bolt Mercer April 19, 2018. Update: We’re no longer doing monthly drawings for keys from our social media sites. As of April 12, 2018, the only way you’ll be eligible to win a key is to sign up for the Rune newsletter. Random users will be selected from this email list to participate in our Closed Alpha Combat Tests in May. If you’ve previously signed up for the newsletter, you’re automatically entered. Im Curious of something. How much does facebook effect chances of being awared a beta key? Because I’m not keen on Facebook, very much. And I’m pretty sure I’m not the only one. I don’ mind giving info to HH, and I like the forums, but I’m not really comfortable giving and IRL info to face book. just create an account check their page out and like it?! Looking at HHKat’s post, you don’t need to like the official Rune: Ragnarok Facebook page to win beta access, but doing so will increase your chances of getting a code, just like creating an account on this site or entering the contests will give you better odds. Hi all! That’s correct – you don’t have to like us on Facebook in order to be eligible to win a beta key. We’ll be selecting winners from each platform. Estou realmente ansioso por Rune, joguei a edição anterior. É realmente surpreendente, parabéns aos criadores. Hello, i’m interested in this game, art looks really cool. TIME TO SMASH SOME SKULLS! Could this be? Am I dreaming? Been waiting unknowingly for 17 years for this. I never thought I would see the day. To this day when I speak of my top favorite games of all time I bring up RUNE in the highest of the high. I played it when it first came out. I even remember how I physically bought it and took it from the shelf. Finding this gem by going from shelf to shelf and looking at that cover arts and reading the back. Please please please give me that Beta key. As a gamer from the 90s and a huge fan of RUNE a new Rune is like a dream come true now. O want to be part of it. Let me be a Beta tester! Wow HOLY HEL ! I still can’t believe it! New Rune! As others have stated – you should focus your efforts at making Rune true to the original forumla: semi-linear, story driven and pure action adventure focused game. Do not make this yet another tiring and generic open world, sandbox-ish, with generic repetitive and pointless endless activities, side quests and some rpg elements like pointless stats, weak upgrades and skills that lacks any impact. We need more and more linear or semi-linear with big maps/levels/worlds – games. These games are the most engaging. Especially story focused games, they are more intense, more meaningful, more memorable and fun to play for a long time. Please don’t make this another fatigue inducing derivative Open World. We have had enough of that in recent years- I think Open World games are a thing of the past, or at least not as attractive. Rune was never about being super open – but it always had big levels with exploration and pathfinding being essential. Some of the best games today are either linear or seamless worlds (Dark Souls for instance). 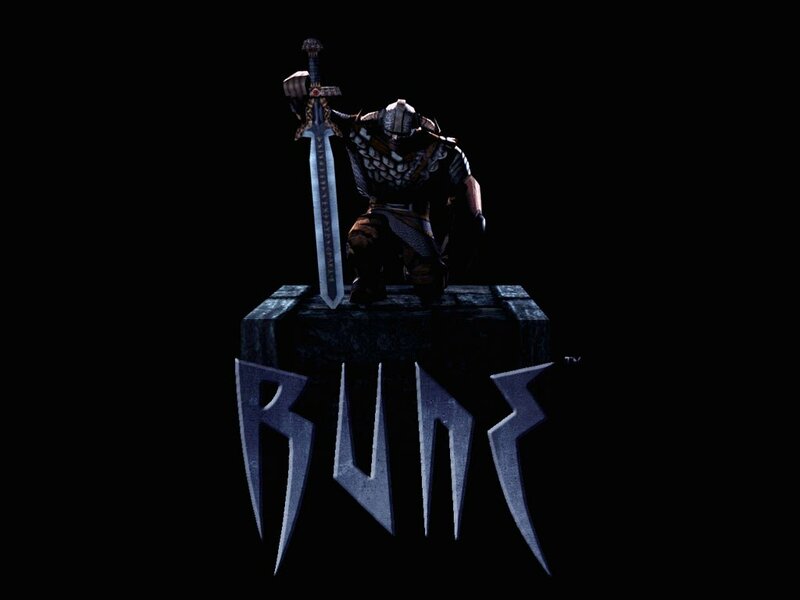 Rune was like The Dark Souls of 2000 – I am saying this because when I first played Demon’s/Dark Souls – it reminded me of Rune in some ways – that’s just how GOOD Rune was. Also – please allow me to join your Beta, I would be grateful, I have been a fan since 2000. This game is among my highest hall of fame games of all time. I bought Rune when I was a small boy. I am now a man. I will continue to fight to stop RAGNAROK – 17 years later the battle continues. Luckily while you guys were off making games I have mastered the blade. Wow this is awesome. I really hope this game will deliver and not be a flop. I played the original rune when it came out and i found it was a great game. The anticipation for this game for certain people (like me) is massive and im trying not to get over excited so i dont feel dissapointed when finally released. I run at risk of over hyping this game but i realise it will be sooo different to the original. Hopefully in a good way. When can we expect to see some more opportunities to earn one of them there beta keys? Used to love playing Rune in multiplayer back in the days, Immediately gave you a FB like guys and took the quiz, cant w8 for opportunity to try this new one. Human Head are drawing a batch of beta keys next week! We're drawing a batch of beta key winners next week! Want in? Here's how you can increase your odds. I LOVE GODS!!!! I need to play this game! Can I get into the beta if I’m registered to the forums but I don’t do any of these steps? The original RUNE helped me usher my impressionable young offspring into the awesomely brutal world of PvP gaming. It was our favorite. We spent countless hours chasing each other around wielding disembodied heads and severed arms, laughing and screaming maniacally. And now the sequel is finally coming! We’re so excited we can talk of little else now. Is this Valhalla? Damn, I can’t believe this is happening. Played Rune and HoV since 2001… and now these great news! Hopefully all efforts will produce a great game. Anxiously waiting for the release. Good luck! I also played Rune 1.0 and Rune HoV looking forward to clashing swords with many of guys here in the forums in the future. I deserve a beta key because you named your lizard after me. man I’m so hyped for this, just had a chat with my friend about the times we spent with the game. glad its coming back. Any news when the betas will be distributed? Hey there! We haven’t announced a date yet. We’ll have more information on that in the next few months. told about this game to all my friends who I know that used to play old Rune, and to a few that didnt. I will once again slay someone with Sigurds axe! No. I can’t lie. My favorite was Trial Pit Ragnar with Trial Pit Mace. I hope this game has just as diverse a console as the first game! Those console commands were fun to play around with. We used to spend hours just creating things in the map to make new gameplay experiences. The game never got boring because the situation was always different. I need a beta key for this game! I liketed Rune as mutch as Half Life so this woud be a very nice price to win wile waiting for Half Life 3 and Rune: Ragnarok Retail release and to keep my mind of the cold Nordic winter longing for the spring. Keep up the good work it look´s amazing so far. I’m down sign me up! The trailer looks great, gotta love big monster games like this. I played the original Rune on PC years ago with my brother and friends at LAN parties. Such a fantastic/fun game. Would love to participate in the beta! This is fantastic news, I wish you the best for the game. I looking forward to play it, and I would like to join the beta test. By the Power of Loki’s Holy Horned Helm! Throw me a keeeeeyyyyyyy! Beta key would be fantastic! CHILE!!. KEY PLEASE LATIN AMERICA.. PC MASTER RACER!!!!!!!!!!!!! Can not wait for this new RUNE Game. I loved RUNE so much. Easily the best Viking Game ever. I hope we get the old classic brutal fighting mechanics and a good Singleplayer experience again. Waited so long for this. Keep up the good work! I would like to win a key to play this game. Hell, YEAH !!!! Waiting for a f****g long time and I’m very excited. Interesting game fellas, looking forward to it! Beta key or not, nothing will stop stop the blade of my axe from vanquishing my foes. I proved my worth in Rune and I will do so again in Rune: Ragnarok. Prepare yourselves. I love the norren mythology, so a key for the beta will be awsome. This game looks awesome! I can’t wait to try it. Hope I get a beta key to provide some feedback. I’d more than happy to get a beta key being a rune and rune HoV veteran. Consider a copy rune ragnarok bought by me day one! Hope i win a key, i played a lot of the first Rune, and can’t wait to see this game now! Thanks for bring back our good memory from the old games! Wow! Finally! I was waiting for this game since 2000! Can’t wait to have it. I would like to offer my soul and double price of the game for beta test. But i don’t have any of them. I lost my soul immediately when i see the trailer because i realized i have no chance to get beta key of the game. And i am drinking non-stop because of the sarrow of not having the game. May the gods give me patience to wait the release. Very excited for this Game to come out. I am signed up, and i follow you guys on Twitter. But i stopped using facebook years ago, i can’t stand that site. I use google plus, Twitter, Vk.com, Dailymotion for my social media business and personal use. Hope i get a key though, would love to test the game out, i also have install Rune Classic/GOLD 🙂 I even have Rune on a jewel case, with that custom made CD Cover. omg. legend is almost here! Я бы с удовольствием поиграл бы в такую игру, мне очень импонирует сеттинг скандинавской мифологии, да и выглядит игра очень даже хорошо, так что жду с нетерпением ! I do not know the game, it was on my Facebook and I saw some news about this game and I was very interested. I hope for a conversation about my channel and also of course, have fun with friends. This seems to be a beautiful game. a friend just tagged me in a post on FB and your making a squeal to my favourite game ever. so strange that only last week me and my friend where talking about how we used to play the multiplayer back when and how it was such a amazing experience. i hope you’d create another multiplayer very similar to the last. Our favourite maps where the arena type maps where you start of in a room full of weapons to choose then enter the arena with the weapon of your choice to smash your mates head in haha. in other maps I used to get the small axe collect all the power ups as it’s ability to throw the axe over and over was OP OP. You guys are recreating my childhood and I have never been so excited, I blame the first game for my obsession with vikings today. The trailer looks so good guys and 100% be following this game, buying it and playing it for many hours!! I buy a new pc, last week, this game is perfect to burn my new grafic card. Please give me the beta key!!! My GOSH I am pumped! My dad and I used to play this game (when mom wasn’t home) when I was a little kid. It is still one of my favorite memories. this game looks very intersting and very fun! I hope to be able to join! My english so bad… but I want key from this epic! I wanted to ask whether I am still able to post a fanart to have a chance to win the contest? i would like to win a beta key maybe be the next big game for me and my boys we all have pcs is this a solo or muti online player game ?? Quero muito jogar, esse AAA mmorpg, tomara que seja B2P. Para diminuir chances de bots. El mejor juego de la vida!! I would like to have a beta key too. I need to play this game! I am so excited to start my way to Valhalla! This games sounds so amazing, i love the nord culture and mythology, i hope this game be so good how the own nord mythology and the viking culture. With my mighty hands I will take the sword from my fallen enemies and slay anyone who stands in my way. After years of waiting for a game somewhat like Viking: Battle for Asgard to come out, i am so pleased to see that this game will definitely surpass it and will gladly be one of the first in line to purchase this game. This game already has me hyped like crazy! My last viking itch was scratched a long time ago, so I really hope I get one of them keys! Also super excited bout them contests! I Love the World of Vikings! Who says anything about MMORPG? Where is that coming from? This came out of nowhere and I’m pleasantly surprised. I do not know much of Rune – ive never played it before but i am Scandinavian and and have strong norse ties and game looks really cool ! Please very kindly pick me to actually win a Rune: Ragnarok Beta Key officially please Human Head Studios devs!!!!!!!!!!! Rune player since 2003 – Looking forward to this beta for over a decade! Me encanta todo lo relacionado al mundo vikingo! muero por jugar este juego! I am a big fan of Rune. Sou um grande fã do jogo Rune. Hey friends from Rune, =!TIF!=Koffer here ( from Rune classic ). Maybe The immortal fighters are going to back in Rune? Who knows… good luck! Im really Hyped for this open World game. I hope to get beta key to get part of this amazing World. Keep on the Good work!!! Nice! Rune -HoV was my favorite number 1 game of my youth. Hope to get a key and meet all those enemys and friends from the old times again. I‘m looking forward to it, good luck Humanhead, do your best that it will be as good as the first one! hellheah! Friend were i play with on a daily basis, told me about this game. tooking real ‘cool’. wow genia, espero ganar una beta key, soy muy bueno y pienso dedicarle muchas horas! Damn!, Looks like I’ll “never” recieve a Rune: Ragnarok Beta Key officially, hell!,… I give up waiting to get one actually! Anyone know if this game releases for the ps4? Beta Key I very seriously request to recieve for Rune: Ragnarok officially Devs!!! cant wait to try this game! fingers crossed for beta access! So excited for the beta! Why aren’t you selling! Looking forward to see more from this game, would be really glad to join the beta. Good luck to everyone who has it, or have the willing to have it. How have i not heard of this game?? I have 1000+ hours playing ark survival evolved, I’ve played it since it ran at 15 fps :). Hope I get a chance to play/develop this game! I love Norse mythology and sandbox games. Can’t wait to see where this game goes. I loved Rune games the one on the PS2 was so fantastic! It’ll remind me my childhood when I cuted heads with my greatsword. Me fez lembrar do clássico Rune Halls of Valhalla, quem nao passou noites jogando nas varias arenas que tinha….. nostalgico….. Please email to me a Rune: Ragnarok PC game Beta Key officially somehow please Devs!!! the reason is, i like all about the viking mythology really very well! this sword was thought to have thought to have beheaded loki during the great war. the sword dealse a great amount of damage to any enemies in its path it is one of the strongest swords known to man. the only wielder of the magnificent sword is the great odin because he is the only one strong enough to pick up the sword, but legend has it that one day someone will come and pick the great sword of pride up one more time to defeat ragnarok once and for all. Hello I want to win a Rune Beta Key, because i want to smash some skulls and drink wine from them and also i want to to fight for glory and mighty gods! keep calm BoS_Propperganda i want to win a beta key because i like to play ragnarok. Good idea, Hedy! 😉 Here’s the link for those who are interested. Once i played the old single and multyplayer rune. I liked the way of playing this game. Hopfully the new rune is as fast and bloody (blood is verry important and that smashing with armes and heads) like the old one. A magnificent tribute to “rune” first game. The topic ‘How to Win a Rune Beta Key’ is closed to new replies.